How Automation Enables a Smart Helpdesk Plugin? This article is meant to give a sneak peek on how automation plays a significant role in a helpdesk plugin and how WSDesk, a WordPress HelpDesk plugin uses automation to achieve efficiency. “By 2018, automation is going to be in full swing in the United States and around the world. There are estimates that it could replace 50 percent of our jobs. That is an enormous shift. But even if we go through a phase where we have an unemployment valley from automation, there will be new jobs and new things for us to do. Automation is a precursor to Artificial Intelligence. Going by the current stats, AI is not taking over WordPress for at least a few years to come. But automation already has. Thus, when we talk about a smart plugin, we do not necessarily mean an AI equipped plugin, we actually mean a plugin which has smart automation features. The small number of AI powered plugins which are currently available at wordpress.org fall mostly in the categories of either customer service or content curation. We often give ourselves to quick reports which claim that in the next 15 years, machines are expected to carry out a number of human jobs efficiently which also includes customer support. In US alone, 40% jobs are expected to go away! Currently, in order to provide a seamless experience to most of the customers, chatbots are employed. 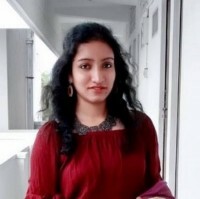 As per experts, these chatbots are able to resolve a mere 10-35% of the customer queries without any human intervention. Let’s say with the progress of technology, the number might reach 40%. “Automation is good, so long as you know exactly where to put the machine. But on closer inspection, it looks like rather than taking the jobs away, chatbots would aid the customer support agents by letting them focus on major issues and taking away the monotonous part. Thus, from the impact Automation is having on customer service currently, it can be predicted that the ingress of AI in customer support would be good news. “The first rule of any technology used in a business is that automation applied to an efficient operation will magnify the efficiency. The second is that automation applied to an inefficient operation will magnify the inefficiency. What is the use of automation in a helpdesk plugin? One of the basic requirement of a software is the need to reduce manual tasks. Some amount of automation can prove to be a helpful hand to the support agent. Automation would allow them to shift their focus on issues that actually requires proactive engagement and smart decisions. By automating support agent’s tasks, a helpdesk guarantees more efficiency and customer satisfaction. An ideal helpdesk solution must provide the options to configure automated tasks and allow some flexibility to the support agent as to decide which tasks are to be automated and which better be left manual. A smart helpdesk plugin’s functionality should not be limited to just assigning tickets to the support agents. It should be efficient enough to detect and rectify the manual mistakes. What are the tasks that should be automated? Think about all the possible recurring tasks in your helpdesk system. In the complete lifecycle of a ticket, you would encounter a number of repeated tasks that eats up your time and at times can give you unnecessary headache. A few of such tasks are – Ticket Assignment, Ticket Workflow, Auto Replies, Knowledge Base Integration. Ticket assignment is required to be automated in order to minimize the time spent on manually going through all the tickets and then identifying which should go to whom. Ticket’s workflow is important in order to free your support system from committing any fallacy. What happens when a ticket accidentally gets tagged as resolved? Imagine going through all the tickets manually and having to mark them as “Resolved”! Instead a smart helpdesk system should be able to identify tickets which should be marked as resolved based on whether the customer has come back within a given timeframe or not. In a proper workflow, any scope of such mistakes are dismissed forever. “We see our customers as invited guests to a party, and we are the hosts. It’s our job every day to make every important aspect of the customer experience a little bit better. Auto replies are absolutely necessary when you have a large number of tickets to handle. There appears to be some cases where a scripted thoughtful reply wouldn’t harm. Though overdoing of it might do more harm than good. For instance, an automated review reply can be fired after a ticket is marked as resolved. With the feature of “Auto-suggestion”, the system can suggest all the relevant articles to the customer while he is typing his queries. This can significantly reduce the task of both the customer and the support agent. And this is done by leveraging your knowledge base. Sending email notifications is one of those advanced features which gives the final professional touch to your support system. The replies getting directly delivered to the customers’ email assures them of the fact that you genuinely care among having several other advantages. WSDesk is a WordPress helpdesk plugin which incorporates a good deal of automation. At WSDesk, automation is employed through the innovative use of “triggers”. Triggers initiate actions based on certain conditions that you specify. Manually assigning tickets is one of the most arduous task. Along with reducing the efficiency of the team, the process is error prone too. 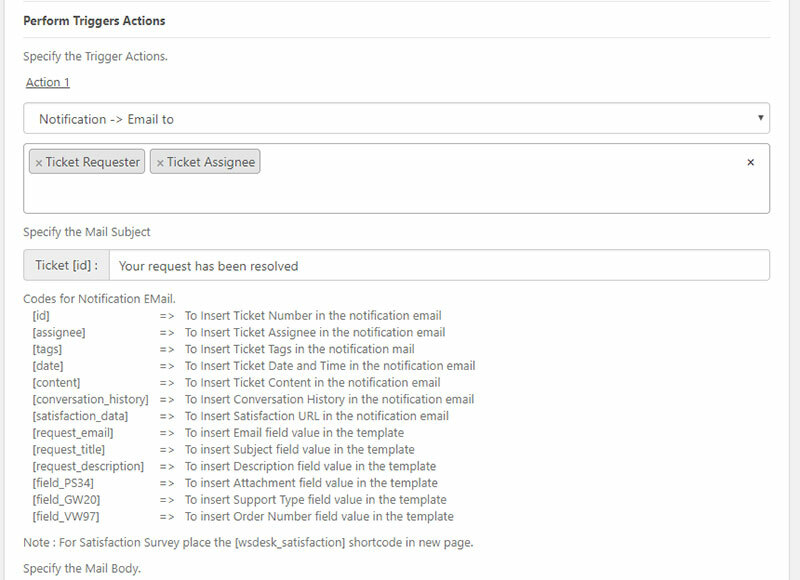 Automating the ticket assignment process can definitely enhance the quality of the entire support system. In WSDesk, a number of conditions can be created for auto-assignment. Depending on the conditions, some actions are defined. In our current case, the action would be “Ticket Assignment”. And let’s say we define the following conditions. In some cases, you might want to prioritize “pre-sales” and refund tickets. The reason might be that “pre-sales” are opportunities to increase revenue and “refunds” are opportunities to prevent possible revenue decent. Thus, you might want your most efficient agent to handle all of these tickets and want the tickets to go directly to them. In some other cases, you might want to assign tickets based on Product names. In that way, agents having expertise on the concerned products would handle those tickets. Conditions can be created and combined with either AND or OR. 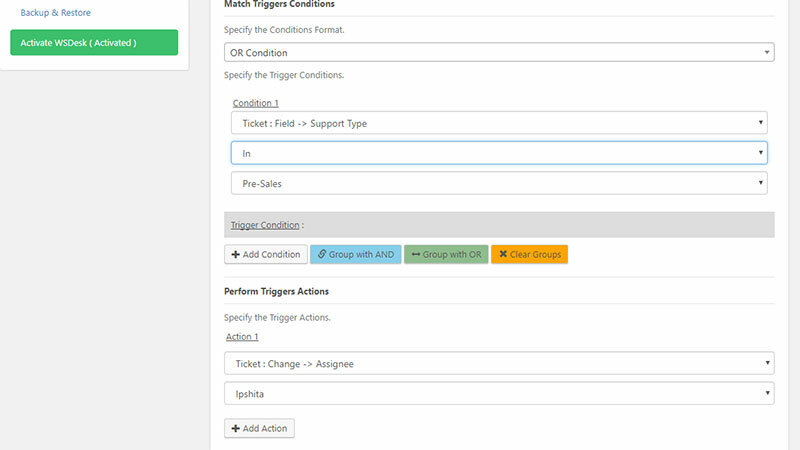 WSDesk, with the aid of Triggers can send automated emails to customers at various situations like when the customer creates a new ticket. 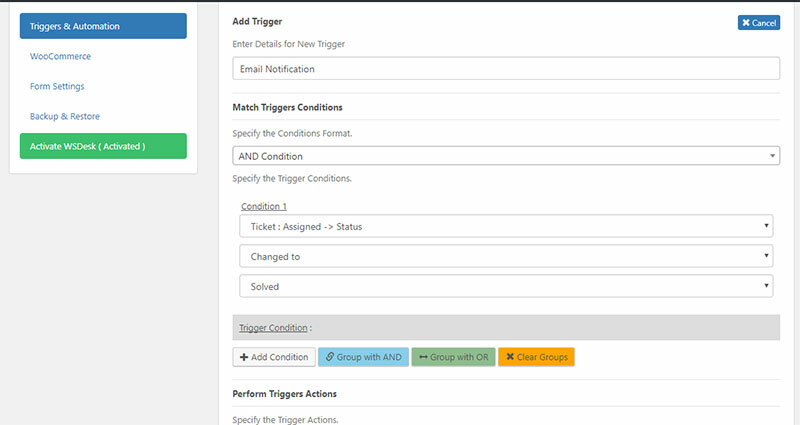 Even when the ticket status is changed, automated emails can be triggered to the customers. Now, you can set up the required Action, which in this case is “Email Notification” to customers. You can also configure email templates as to what information should go into the mails. Further, there’s short-codes to insert some specific content into the email text. Integration with knowledge base is one of the most important feature of a helpdesk plugin. This gives the user the ability of self-help. A number of popular helpdesk plugins are now working to make an effective knowledge base integration. WSDesk is not behind on this. WSDesk integrates the knowledge base with the “Auto-Suggestion” feature. When the “Auto-Suggestion” is enabled in the settings page, both the customers and the Agents are benefited. When your customer visits your “Support” page and types the Ticket Subject, all the matching articles would be suggested to him. Thus, your ticket count might really reduce..
Further, a new agent would have a lot of help answering the customer queries. That’s it! Hope this article has given you some insight on how automation can be used to improve the efficiency of your support system.